One of my favorite toys is my Kreg Drawer Slide Jig’s. There are actually two jigs that you’ll want to use to help you install a drawer. 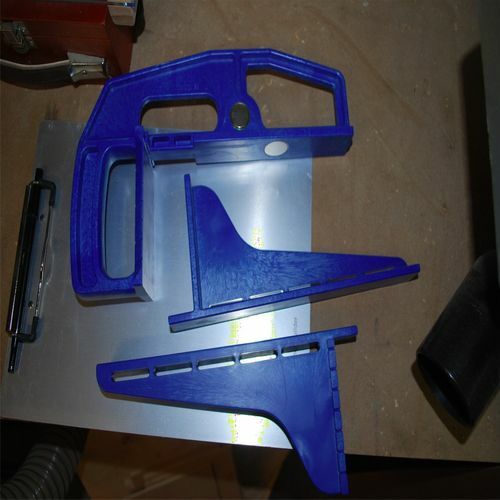 The first is the Kreg Universal Drawer Slide Mounting Jig. This jig makes it extremely easy to take attach a drawer mount to your project. It has a magnent and a small lip on the bottom of the jig that allow it to hold your drawer slide for you. All you do is put your drawer slide on it and then clamp the jig to the case or cabinent your working on. Another plus is that it will keep it at a 90° angle making it easier to keep everything plum when you install it. Another thing that I have used is a drawer slide back bracket. This is a really nice thing to use if you can’t mount the drawer slide to the sides of your project. It holds the drawer slides in place and really anchors it in place. The second jig that is really great is the Kreg Drawer Mouting Brackets. These brackets are fantastic for holding the drawer in place after you have installed the drawer slides. Simply clamp the brackets to your project and sit your drawers on top of the brackets. Then site your drawer on top of the brackets. The drawer sits at the perfect height as it lines up with the width of the mounting jig. With the drawer sitting on the brackets all that is left is to pull the arms to the drawer slides out and attach them to the drawers. The entire process is really easy and makes it quick to install drawers into a project. My overall recommendation on these jigs is a big A+. My only complaint really is that I believe both jigs should be sold as one kit, or at least available as one kit. These items are manufactured by Kreg and you can find them at Amazon or Rockler. I have a few more pics and links available over at woodlogger. Boy, wish I had this jig when I was installing cabinets.I used to line everything up by eye then go back and readjust the crap out everything I had installed.Nice post! I wish I had these on my sideboard build. I only had 2 drawers but with only half a clue, there was a lot of room for things to go wrong. I know blum have something similar, but neither are available easily to me. I think I will need to fabricate a jig myself for those tasks. I went to purchase these before reading your review but after watching some YouTube vids on them. My local Woodcraft stoe did not have any in stock and after checking they said they’ve been discontinued. I haven’t followed up on that to confirm it so I think I’ll just use the homemade jig version (a board cut to the correct height placed against the cabinet side). Wouldn’t a steel speed square work the same?